Bahraini and Algerian athletes continued to dominate athletics competitions that were held on Thursday as part of the Arab Women Sports Tournament (AWST), which runs until February 12. The fourth and largest edition of the AWST is being held under the patronage of Her Highness Sheikha Jawaher bint Mohammed Al Qasimi, wife of His Highness the Ruler of Sharjah, Chairperson of the Supreme Council for Family Affairs and Chairperson of Sharjah Women’s Sports Foundation (SWSF).The athletics games were held at Al Thiqa Club for the Handicapped in Sharjah, and witnessed participation from 11 clubs in 11 Arab countries who competed in the following categories: 200m final, triple jump, 1500-metre run and hammer throw.In the 200 m competitions, Hajer Saad Al Omairi from Bahrain’s Busaiteen Club finished first in 25.31 seconds to win a gold medal, followed by Algerian Shema Wanis who clocked a 27.10-second finish, ended by a close third by Bahrain’s Zainab Abdul Hussein who registered a time of 27.94 seconds. 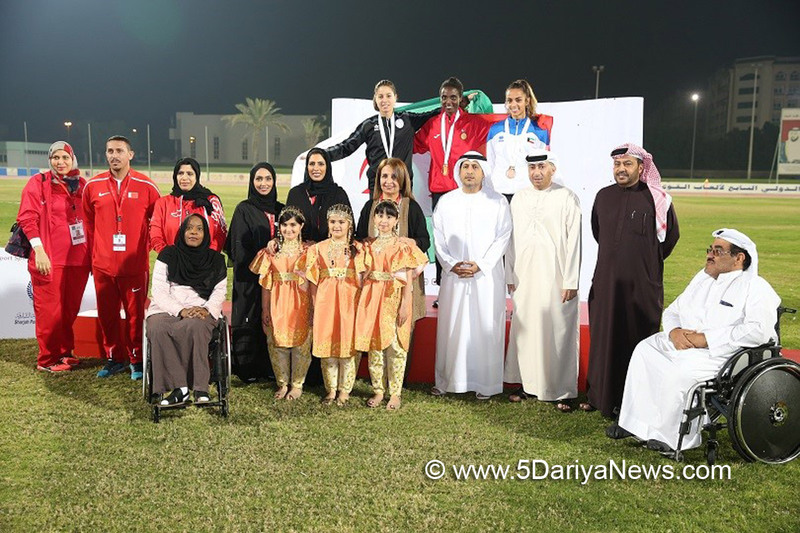 Bahrain’s Marta Hirbatoyota from Busaiteen Club won gold in the 1,500-metre run in 4, 38, 63, while Algeria’s Abeer Faris claimed silver in 4, 47, 42, and Kuwait’s Amal Yousef Al Roumi from Al Fatat club finished third in 4, 58, 99 to win bronze.In triple jump, Algeria’s Kawthar Salma threw a splendid 11,80m to win gold, while Egyptian Asmaa Mohamed from Port Fuad Club came second (11,37m) to win silver, and Mariam Kazem from Kuwait’s Al Fatat Club claimed bronze (10, 32m). In hammer throw, Oman’s Doha Al Sennawi from Al Khaboor Club came first after she threw 34, 87m winning gold, followed by Kuwaiti Mariam Al Enazi who threw 34, 26m to win silver, and Bahraini Amina Sultan Al Mubarak from Busaiteen Club who claimed bronze who threw 28, 22m.The three winners were honoured with medals that were given by Sheikh Issa bin Rashid Al Khalifa, honorary Chairman of the Bahraini Olympic Committee; Sheikha Hayat Bint Abdulaziz Al Khalifa, Board Member of Bahraini Olympic Committee and Chairperson of AWST’s Follow-up and Supervision Committee; and Colonel Dr. Abdul Aziz Al Noman, Secretary General of Sharjah Sports Council. Also attending the felicitation ceremony were Ahmed Al Madhloum, Secretary General of the UAE Disabled Association and Executive Director of Al Thiqa Club for the Handicapped, and HE Nada Askar Al Naqbi, Deputy Head of AWST's SOC, Head of the Executive Committee and Director General of SWSF, along with heads of delegations participating in the tournament and several sports officials.Commenting on the results, Dr. Abdul Aziz Al Noman, Secretary General of Sharjah Sports Council expressed pleasure over the technical levels of the competitions. He said: “The participation of a large number of athletes in the tournament is a testament to the importance of AWST in bringing together players from Arab countries and highlighting the region’s athletic talents, especially because there are no other Arab women’s sports championships except this one in the UAE.” Al Noman attributed this to the wise vision of the UAE leadership, which attaches a great deal of attention to sports and the role it plays in overall human development. He thanked His Highness Sheikh Dr. Sultan bin Muhammad Al Qasimi, Member of the Supreme Council and Ruler of Sharjah, and his wife, Sheikha Jawaher bint Mohammed Al Qasimi, for their immense efforts to advance women in sports represented in organising the AWST biennial and increasing its sporting disciplines in successive editions. Karate was added to the list of sports this year, and talks of featuring chess competitions in the next edition are underway.